Pet abuse is being taken to vile new depths as puppies are shot with crossbows, cats are kicked like footballs and frogs and lizards are swallowed for juvenile Neknomination pranks, new figures suggest. The damning statistics were released by the Royal Society for the Prevention of Cruelty to Animals (RSPCA) on Wednesday. 2014 saw a significant rise in cases, with the charity investigating 159,831 complaints compared to 153,770 the previous year. One out of every eight cases was shown to involve deliberate and violent cruelty – a total of 20,258 cases. The RSPCA’s top vet James Yeates said new and vicious methods are being used. “It is extremely concerning that we are still receiving more than 20,000 complaints about animals being deliberately caused to suffer and that’s 20,000 too many,” Yeates told the Guardian. As well as shot dogs and swallowed amphibians, an eight-week-old Jack Russell terrier was found to have had its tail cut off and a rabbit was reportedly microwaved in Gloucestershire. 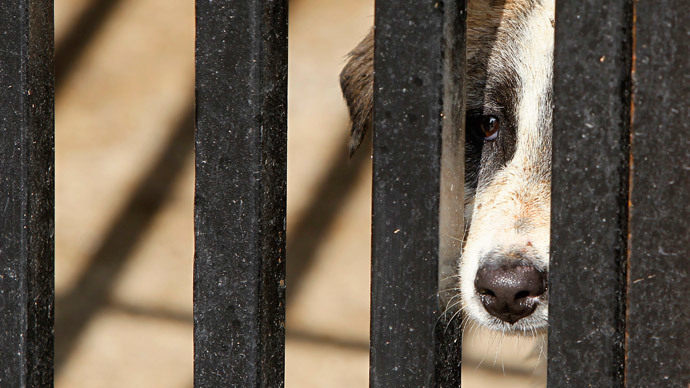 Despite the new figures, convictions for animal cruelty fell in England and Wales from 1,371 in 2013 to 1,029 people last year. Yeates said that most cases of mistreatment reported to the RSPCA were solved through simple advice on issues like proper diet and welfare. “Our aim is always to prevent cruelty so it’s really positive that a greater number of people followed our advice. “Crucially this means that although we are still receiving complaints about cruelty we are often getting to incidents before suffering has occurred and helping owners to provide for their animals, whether that means getting veterinary care for them or just giving them the right diet,” he said.